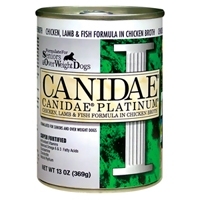 Canidae Platinum Chicken/Lamb/Fish - 12/13 oz. Can Cs. 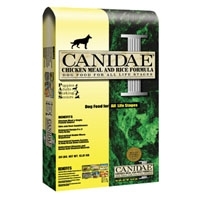 All Natural Dog Food Formula with Three High Quality Meats: Chicken, Lamb & Fish, and Reduced Fat and Protein – Dogs Love the Taste! All Natural Formula with Lower Protein, Lower Fat and Reduced Calories. Made with Glucosamine and Chondroitin to Promote Better Joint Health, and Essential Vitamins and Amino Acid Chelated Minerals. CANIDAE PLATINUM® Senior and Over Weight formula meets the AAFCO Dog Nutrient Profiles for maintenance. We've changed our Grain Free PURE Sky formula to include just 8 ingredients-along with natural flavors, vitamins, minerals, and probiotics. 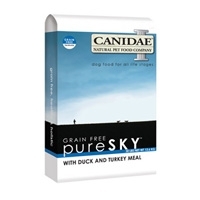 Our new Grain Free PURE Sky recipe is made with fresh duck, plus high-quality duck meal and turkey meal. We also use whole foods including sweet potatoes and peas for naturally great nutrition. Grain Free PURE Sky contains 41 grams of protein in every cup. That's equal to a 7-ounce duck breast with a side of sweet potatoes and peas! Grain Free PURE Land recipe now include just 7 ingredients-along with natural flavors, vitamins, minerals, and probiotics. 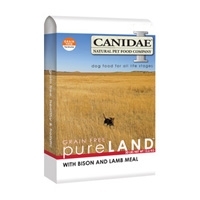 Our new Grain Free PURE Land recipe is made with fresh bison, plus high-quality lamb meal. We also use whole foods including sweet potatoes, peas, and chickpeas for naturally great nutrition. Grain Free PURE Land contains 32 grams of protein in every cup. That's equal to a 5-ounce bison steak with a side of sweet potatoes and peas! Canidae Grain Free Pure Elements All Life Stages - 12/13 oz. Can Cs. 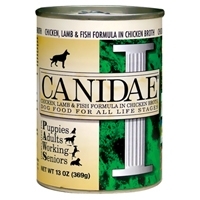 CANIDAE® Grain Free pureELEMENTS™ is a super-premium canned dog food featuring Chicken, Turkey, Lamb and Fish. The perfect complement to dry feeding! 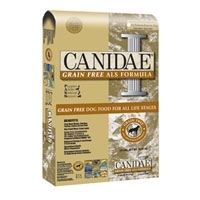 CANIDAE® Grain Free pureELEMENTS™ was designed with happy, healthy pets in mind. Made with excellent quality ingredients blended for optimal nutrition, CANIDAE® Grain Free pureELEMENTS™ is the modern answer to primal nutrition. From CANIDAE Natural Pet Food Company, a Trusted Brand Since 1996. 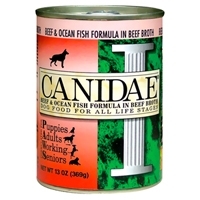 Canidae Can Dog Beef & Fish - 12/13 oz. Can Cs. 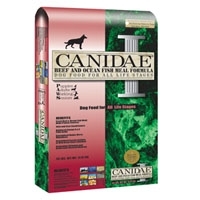 All Natural Dog Food Formula with High-Quality Beef and Fish Meals — Dogs Love the Taste! Nutritionally dense fresh meat and meals originate from meats processed in a human grade facility Protein Rich Beef Meal Made from USDA Inspected Fresh Beef from a Private Herd in the Midwestern USA Provides Wholesome Nutrition and Increased Energy Levels. 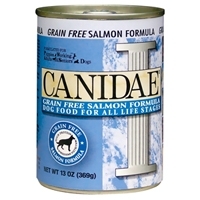 Canidae Grain Free Salmon - 12/5.5 oz. Can Cs. We've changed our Grain Free PURE Sea formula to include just 8 ingredients-along with natural flavors, vitamins, minerals, and probiotics. Our new Grain Free PURE Sea recipe is made with fresh salmon, plus high quality salmon meal and menhaden fish meal. We also use whole foods including sweet potatoes and peas for naturally great nutrition. Grain Free PURE Sea contains 41 grams of protein in every cup. That's equal to a 7 ounce salmon steak with a side of sweet potatoes and peas!! 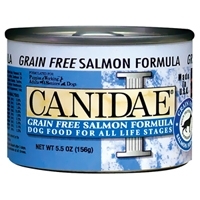 Canidae Grain Free Salmon - 12/13 oz. Can Cs. We've changed our Grain Free PURE Sea formula to include just 8 ingredients-along with natural flavors, vitamins, minerals, and probiotics. Our new Grain Free PURE Sea recipe is made with fresh salmon, plus high-quality salmon meal and menhaden fish meal. We also use whole foods including sweet potatoes and peas for naturally great nutrition. Grain Free PURE Sea contains 41 grams of protein in every cup. That's equal to a 7-ounce salmon steak with a side of sweet potatoes and peas!! Canidae Can Dog Lamb & Rice - 12/13 oz. Can Cs. Dogs come in all shapes and all sizes, but their food doesn’t have to. 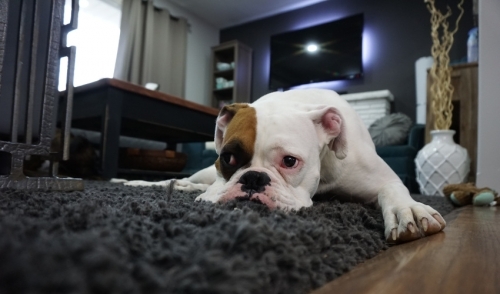 Multiple dogs and growing puppies can make mealtimes complicated. 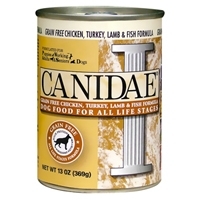 With this CANIDAE® Life Stages, All Life Stages formula mealtimes are easy—even for multiple dog households. 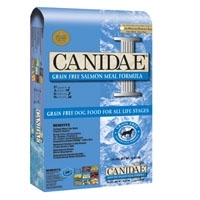 High-quality meat and fish meals, delicious flavor, and our scientifically formulated nutrient-rich recipe make this food a great choice for every canine in your family.